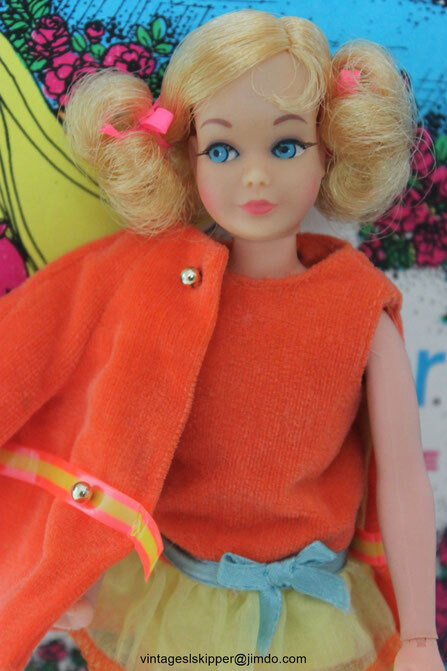 In 1970, Mattel introduced a new kind of body for Skipper - a body with movable joints. Her head mold stayed the same, but now she had a different hairstyle with two pigtails. The hair fibre used for these dolls was different from the fibres used before, it is stronger and looks more synthethic. She was available in strawberry blonde (more common) and a rare pale blonde. 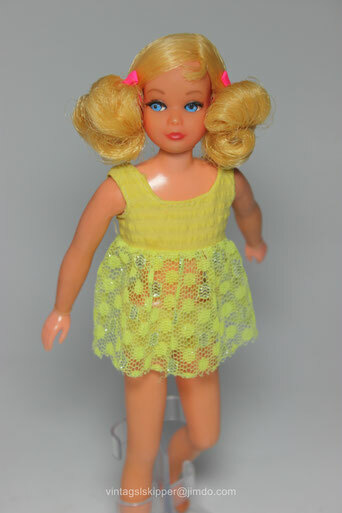 This doll was called #1147 Living Skipper, and came with a clear plastic stand, a blue, pink and green swimsuit, and booklet and was sold in a trade-in box. People could trade her in for 1.99 US $ and a used Barbie doll. In 1970 the same doll with the same accessories was sold in another box, she was called Dramatic New Living Skipper. Her new stock number was #1117. The Dramatic Living Skipper #1117 was sold in 1971. She was the same doll like the Dramatic New Living Skipper, but she came dressed in a new yellow two piece swimsuit" and with a new box and an orange skateboard. Her markings stayed the same. The stand was a two-piece clear plastic stand which is very rare. The packaging and skateboard are very hard to find, the swimsuit is hard to find. 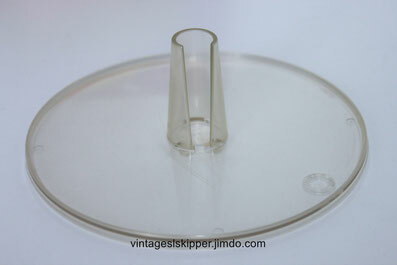 The two-piece clear plastic stand with a large round platform is rare. It was only sold with this doll and with Dramatic New Living Fluff. Pictured is the German Barbie booklet that came with this doll: "New! Barbie now has hair that grows!" In 1970 and 1971 Sears sold a "Dramatic Living Skipper Very Best Velvet Set" #1586. 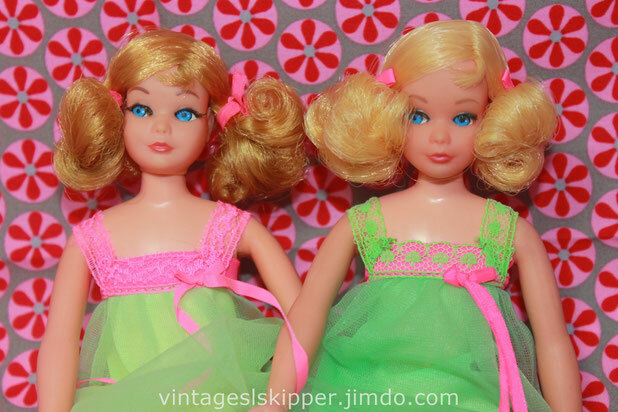 The doll included was dressed in the same swimsuit like the #1147 Living Skipper and the 1970 #1117 Dramatic New Living Skipper and came with a velvet orange dress and coat, yellow pantyhose and yellow flats. Even many long term collectors aren't aware that the Sears Exclusive Very Best Velvet Set was made in Japan and included a very rare Living Skipper made in Japan. This doll is probably as rare (or even rarer) than the Japanese SL Skippers. Some people believe a pale blonde Taiwan Living Skipper like pictured here came with this set, which is wrong. 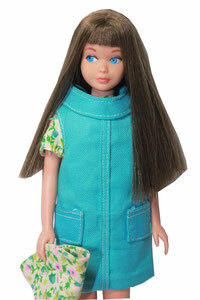 You can see pictures of the correct doll and markings on the "GIFT SETS" page. This doll sold on eb.. for 264 US $ in January 2018 (very good condition).